Kyoto Gyoen is where the imperial family was based during the Heian to Meiji eras. 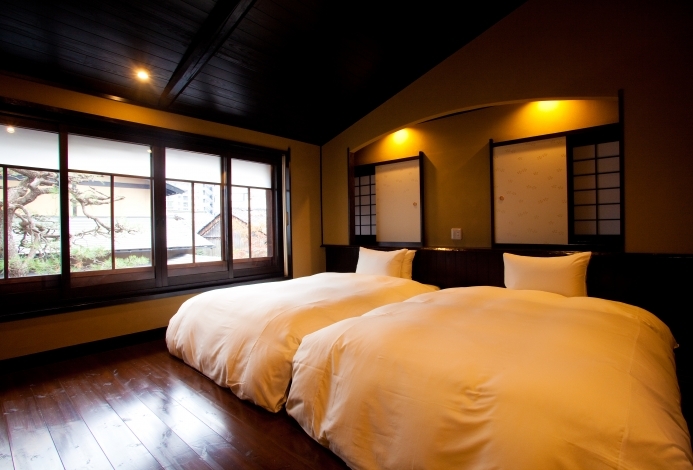 The Junei Hotel is located immediately west of Kyoto Gyoen. There are only 8 guest rooms at the hotel, with each room measuring 50 square meters. 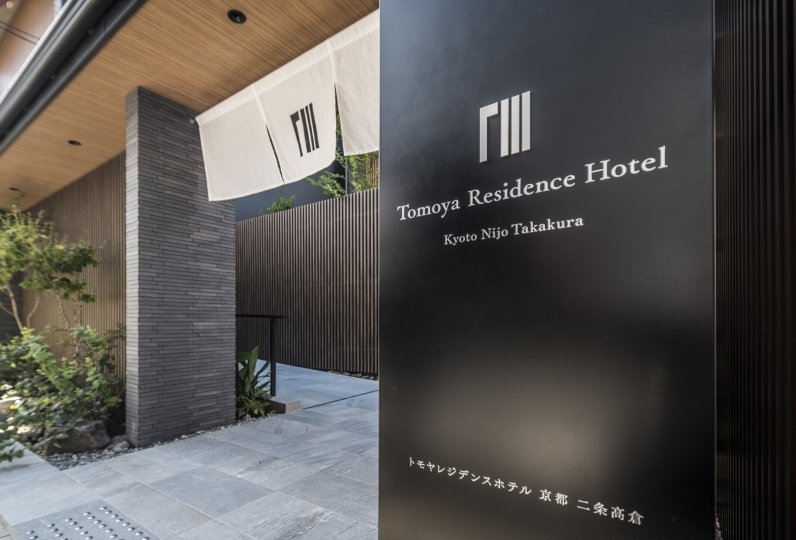 The interior exhibits an upscale Japanese design sensibility and each room is adorned with various artwork showcasing Kyoto craftsmanship, a Serta bed, and a Kyoto-made bed throw. The top notch amenities are sure to provide a luxurious experience for our guests. All rooms are equipped with bath tubs made from the renowned Shigarayaki ceramic. The ceramic has an exceptional touch and is a one-off, custom-made piece. To top it off, the baths are filled with concentrated hydrogen water, which is said to have benefits for the skin. We recommend guests to take a long, relaxing bath in the curated space. aromas, healing music, and fresh tatami which emanates a unique green fragrance. Various provisions showcasing Kyoto cuisine will invigorate your senses. Uji tea, Japanese sweets from venerable establishments, and a catered Kyoto-style breakfast are served to our guests. If you're looking to fully immerse yourself, we recommend participating in activities unique to Kyoto, such as wearing kimono and creating paper crafts. A special plan to invite maiko is also available. This is a rare opportunity, since traditional tea houses typically forbid first-time customers. The wonderful experience begins as soon as guests arrive at the hotel. We welcome visitors to stay at our hotel where you can experience Kyoto through the five senses. Room and bath were wide, it was very good. Thank you for your hospitality on the memorial day. I was able to spend very happy. It was a pleasure to have a celebration. There are only two points to worry about. · Since Wi - fi was very unstable, I think I should improve it. · There was a convenience store bag in the drawer. I wonder if the previous one got in? It was that kind of feeling. I would like to go there again if there is opportunity. Thank you very much. The quality of related equipment are good, the room is very comfortable. However, the heating facilities may need to be overhaul to avoid occasional breakdown; the accommodation encountered the problem of heater failure, but still acceptable. There is no restaurant inside the hotel, but we do cater breakfast that will be delivered to your room. The cuisines are made with seasonal ingredients in Kyoto. Please note that we may not accommodate changes in service times to maintain the freshness of the food. Thank you for your understanding. The bath features a soundtrack of trickling streams and chirping birds that was compiled by a sound designer. The soundtrack will enhance the healing effects of the bath. The custom-made Shigarayaki bath tub radiates infrared rays to warm your body to the core and minus ions to provide relaxation effects. Finally, the hydrogen water is said to provide beautifying-benefits for your skin. Sip Uji Wazuka tea from a Kyo-yaki style Hanakessho tea cup, which is renowned for the glass-like veneer that mimics a blooming flower. 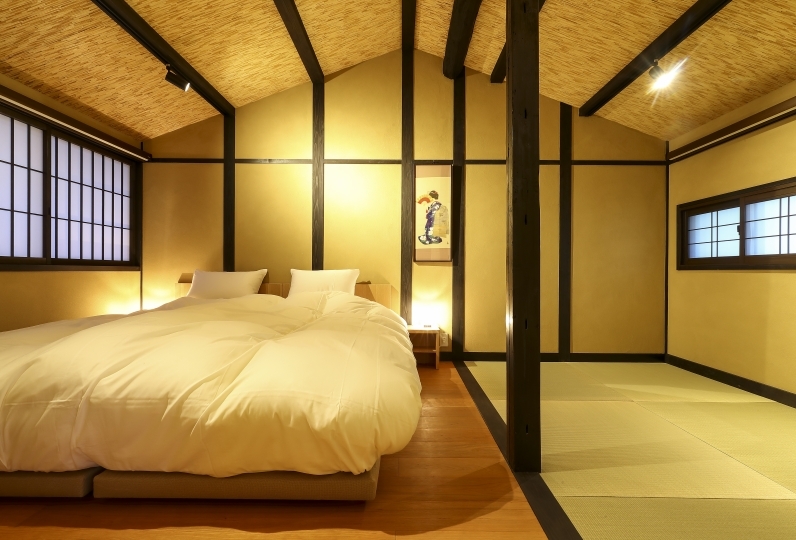 1.The guest rooms are floored with both carpet and tatami. 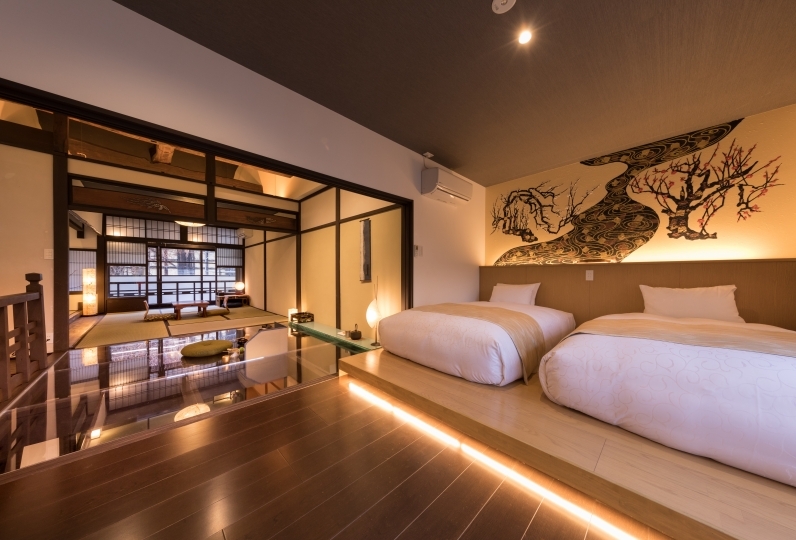 Panels made from Kamisoe-style art paper and bed throws weaved from Kawashima textile feature different colors and patterns for each room. 2.Guests are welcomed with a traditional Japanese snack from Kameya Kiyonaga, paired with 3 types of Uji Wazuka tea, selected by a tea sommelier. 3. 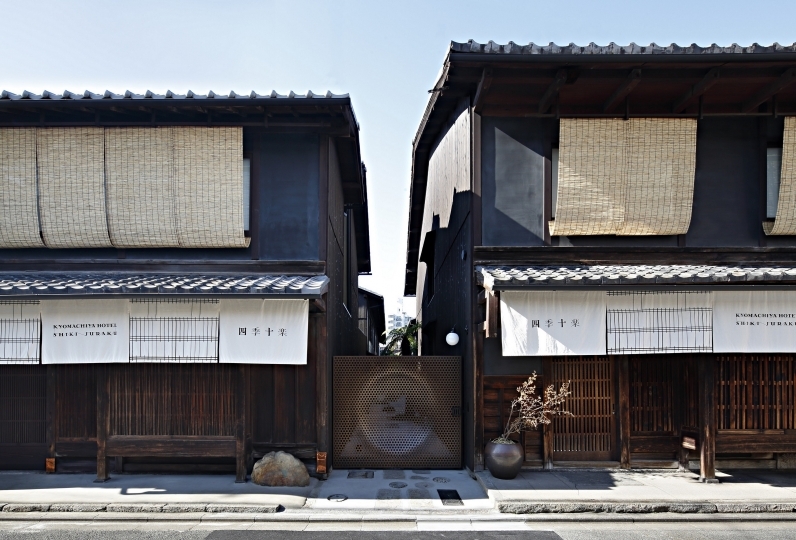 The building exterior was designed with a Kyoto townhouse in mind. The building itself is new and is earthquake and sound proof. 1.We can hold luggage before and after check-in and check-out, free of charge. 2.Pre-school children may stay free of charge. Elementary students and older will be charged as an adult. For guests traveling by car, we do not have a parking lot. As such, guests will have to park at nearby coin parking garages. 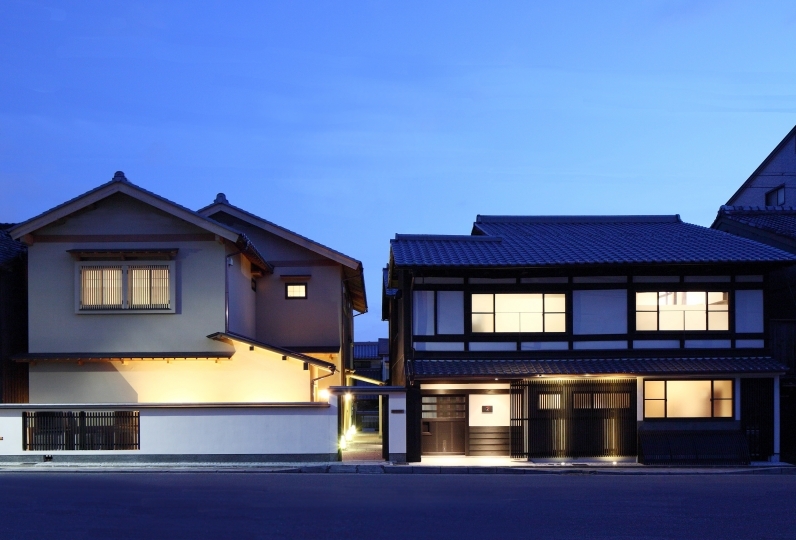 To preserve the spirit of a Kyoto townhouse, we do not have elevators. We recommend guests with mobility disabilities and pregnant guests to book the 1st floor room with a garden. The hotel does not have a restaurant. Please eat before going to the hotel. Please notify us if you plan to enter the hotel after midnight. Ask the driver to turn east at the intersection of Higashihorikawa Dori and Demizu Dori. The hotel is 2 houses down from the intersection.